THIS THURSDAY, June 6th! DON’T MISS IT! I’ve always been a fan of service providers that can guarantee me fast, reliable Internet and unbeatable TV picture quality. Which is why Verizon FiOS is at the top of the list, especially because they deliver 100% fiber optics straight to my door. But it’s not just about the picture quality; it’s also about delivering great content. That’s exactly what Verizon FiOS aims to do by being the provider with the most Spanish language channels. As if that wasn’t enough to make me a fan, they’ve added additional soccer channels to the list! They added beIN SPORT, and beIN SPORT HD en Español, both multi-platform sports destinations that will bring the passionate fan, like me, all the live game action, news and analysis of the top leagues around the planet. If you’re a soccer fan, or just a sports and tech fan in general (I mean, who doesn’t love Pele!? 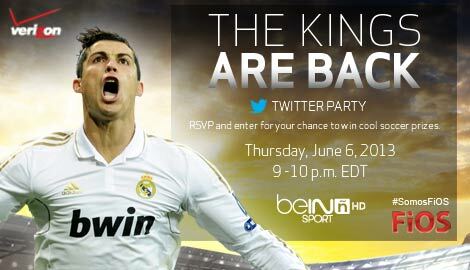 ), come join us onThursday, June 6th for “The Kings Are Back” Twitter Party. The prizes are pure GOL! Stay Connected!Make sure you follow @SomosFiOS and Like them on Facebook for the latest updates and Twitter Party prize hints! Verizon FiOS, an all-fiber-optic-based network that delivers America’s fastest, most consistent, and most reliable broadband connection, as well as TV service with HD picture quality that tops cable in customer satisfaction, offers home communications (Internet, telephone and television) service in parts of 12 states and the District of Columbia. Verizon has received top ratings in major studies and from a leading national consumer magazine among cable television and Internet service providers. With bundles available to suit your needs, FiOS TV offers over 575 channels, including more than 160 HD channels. The FiOS network of Verizon surpassed 17.4 million premises as of the end of the third quarter of last year. At the end of the fourth quarter of last year, the company had a total of 5 million FiOS Internet customers and 4 million FiOS TV customers. FiOS Internet penetration reached 37.3% at the end of the fourth quarter of last year. In the same period, FiOS TV penetration reached 33.3%. beIN SPORT, the English-language 24/7 international sports network, and beIN SPORT en Español are the multi-platform sports destinations that bring to the passionate fan all the live game action, news and analysis of the top leagues around the planet, as well as exclusive and never-available-before content. From American, European and Latin American live games to general sports news and in-depth analysis, beIN SPORT guarantees first-row access to top leagues and major sports properties through TV, online and mobile platforms with games that can’t be seen on any other channel. For more information, please visit www.beinsport.tv and follow us on Twitter @beINSPORTUSA for breaking news and real-time updates.